The great Poet and Lyricist bid farewell to us today at 1730 hours(IST) in Amrutha Hospital in Kochi where he was undergoing treatment since January. 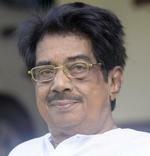 Yusafali Kecheri's contribution to Malayalam Literature and film industry will always be remembered for ever! His words had a magical aura about them gliding people into a world filled with love, literature and gentleness. He was the one who brought the great musical legend Noushad Ali to score the music for the Malayalam film 'Dhwani' and 'Jaanakee Jaane...', the first Malayalam film song with only Sanskrit words blessed the airwaves in the celestial voice of Yesudas! He has received just about all the awards for film songs and his poems, including a National Award for the film 'Mazha' for the Sanskrit song, 'Geyam Harinaamdheyam', beautifully rendered by Yesudas, and has held many academic positions in Kerala. And he has famously declined a National Award when he was selected jointly for the 'Best Lyricist', saying that "The Best can only be One"! He made his debut with the film 'Sindooracheppu', which changed the Malayalam film industry and his songs from this film are still on everyone's lips, so much so that 'Sindooracheppu' is synonym to Yusafali Kecheri! The songs from Hariharan's film 'Sarggam' will always be a tribute for Yousafali Kecheri � Krishnaripa saagaram, Raagasudhaarasa, Aandolanam, Pravahame, Kannadi Aadyamayen etc.There was a time when Malayaalees looked forward to the trio 'Yusafali Kecheri, the music legend 'Bombay Ravi' and the film director T Hariharan', as they turned anything they touched into gold! Yusafali wrote the most seductive words of 'Surumayezhuthiya mizhikale' for his wife Khadeeja and the alluring voice of Yesudas in MS Baburaj's soft music is still caressing our senses and will continue forever! I join the rest of Malayaalees when I say �I love Yusafali Kecheri's songs and his poems�! How can anyone forget his beautiful poems in 'Ormmaykku thaalolikkan', 'Aalila', Kecherippuzha, Aayiram Naavulla mounam, Anchu Kannyakakal, Kecherippaattukal,'etc?! "..Shankichitaathen hridayametuthoru shayya jalopari theerthu njaan..........manivarnnane mellekkitathee njaan" from 'Aalila', and "Naadappaal katalunmathichu Jagadeeshan thanna Peeyooshamaayi..." in 'Ormmaykku thaalolikkan' about Yesudas, are just a few examples! There is another poem in 'Ormmaykku thaalolikkan' that every time I read I am in awe of the great Poet: 'Paataavu Njaan': �Ariyaan kazhingilla ninneyinnola-mennazhake, Ariyaathirunnumillalppamaay... ariyilla Ninne njaanenkilum ninnolamariyilla mattonnonnineyumennullathaa-marivinte munnil marayaay varthikkumarive Mukhapatam maattitheliyaruthoru naalum, Enteyee nithya jinjaasathan chirakatithaalathil paataavu Njaan sada� � such beautiful words, a must read for all those who can read Malayalam! He has written more than 600 film songs � 'Surumayezhuthiya mizhikale, Paavaada praayathil, Krishnakripaa saagaram, Perariyaathoru nomparathe, Anchu sharangalum, Pathinaalam raavudichathu, Omalaale kantoo njaan, Geyam Hari Naamadheyam, Aandolanam, Sathyasaanu sruthicherthu, Shruthiyamma layamachan, Sangeethame Amara sallaapame, Nataraaja padadhooli, Ambilippolipole, Chithranilaavinte, Kanna kannilunni, and many many more beautiful and breathtaking songs are with us for eternity. His songs reveal a kaleidoscope of art and poetry that is evident if one looks at the gems he has given us during the past five decades. I would be doing an injustice if I didn't mention few more songs that display different emotions: Omane nin kavil, Kanyakamaarute naanam, Enikku Ninnodu, Manmatha jwarathinu, Murukkichuvannatho, Ithra madhurikkumo; Maamava Maadhava, Saamassa Sanchaarini, Thozhee ninakkoru kavitha, Marakkaan kazhingenkil, Maranno nee, Mohakkuruvikku, etc! He was a true gentleman who loved everyone he met and his passing is a real loss to Malayalam Literature, film industry and the human race! I bid farewell to the great man in his own words from two of his poems, from 'Ormmaykku Thaalolikkan': �Urangoo Vishwaachaarya, Dharmma rakshaykkaay Veentumunaraan, Unarnnurangunnoreyunarthuvaan�, and �Nonthu nontheevidham Praarthikkayaanu Njaan, Sampreethanaakkatte Ninneyum, Vishvika-Samvidhaathaavin Kalaakaamaneeyakam�! May his gentle soul RIP! My thoughts and prayers are with his wife, Khadeeja, his children, Suraj. Sabitha and the other two daughters.